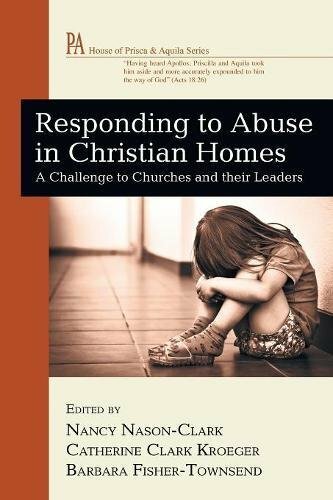 Responding to Abuse in Christian Homes: A Challenge to Churches and their Leaders represents the final book edited by Catherine Clark Kroeger, together with her colleagues Nancy Nason ­Clark and Barbara Fisher-Townsend. Similar to other publications by the late Dr. Kroeger, this book addresses the link between violence against Christian women by their (oftentimes) believing husbands and the incorrect theological presuppositions which enable the violence to persist. This book was born out of the third international conference by Peace and Safety in the Christian Home (PASCH), a nonprofit organization founded by Dr. Kroeger in 2004 and to which she dedicated the remaining years of her life in her fight against domestic violence. The primary audience for this book is pastors of local congregations. However, the insights into the lives of pastors, congregants, batterers, and victims, including immigrant victims, and their relationships to the secular world of social services, is invaluable to any Christian concerned about the limits and possibilities of accessing support outside the church. The insight, experience, and wisdom of the book's twenty-one contributors, including pastors, theologians, social workers, sociologists, psychologists, and others, makes the book both scholarly and practical. It is divided into three sections, each opening with a poem by Robert Pynn. The first section, "A Call to Peace and Safety," examines what needs to happen for a victim to feel safe in her home, marriage, and church. The opening chapter addresses the importance of the correct interpretation of biblical headship, while chapters 2 through 7 focus on the need for pastors to address intimate partner violence (IPV) effectively, the need for batterers to obtain adequate help, and the importance of peace in the home resulting from those beliefs and behaviors that keep marriages healthy. Section 2 describes the barriers and challenges to preventing domestic violence, with each of the four chapters focused on a specific population with unique struggles. Chapter 8 provides evidence of the difficulty batterers have achieving lasting change. Chapter 9 focuses on the additional hardships faced by victims from ethnic communities. Chapter 10 gives advice for pastors on how to work with victims and perpetrators, while chapter 11 provides a compelling look at the challenges faced by professional advocates and shelter workers and their need for support in this difficult work. The final section, "Removing the Barriers and Bringing Peace," focuses on theology, truth, and the practical realities of domestic violence. In Chapter 12, Dr. Kroeger compares the lies of the false prophets who incited Zedekiah with the whitewashing that too often masks the truth about IPV. Chapters 13 and 14 focus on women victims of faith who must reconcile the disconnection between theology and reality. Chapter 15 describes the Religion and Violence e-Learning project (RAVE), an online resource for victims, pastors, and others. Chapter 16 provides advice on how to build bridges between clergy and community-based professionals, and the final chapter summarizes research that demonstrates the lack of information on domestic violence provided to seminary students during their course of study. The strength of the book lies in the collective wealth of experience of the contributors and the diversity of their ministries and relationships to victims and perpetrators of IPV. This book provides a solid theological basis for helping victims find safety and shelter away from their abusive spouses, but moves beyond theology to the sphere of practicality. In addition, the book is filled with true stories of sadness and triumph that add richness to the text, making it easy and interesting to read. Responding to Abuse in Christian Homes is a how-to book for Christians on dealing with domestic violence. In addition to providing tools for helping victims, it asks the right questions: Is marriage worth more than a life? If domestic violence is not tolerated by God, why is it tolerated in many churches? Do seminaries teach enough on domestic violence? While the purpose of this book was not to delve into complex answers to these questions, it helps readers begin that search. As I read this book, I found myself asking additional questions: Have we, as Christians, used the cliché "Hate the sin, love the sinner" so often that we have lost sight of what love and hate really mean in the context of IPV? Could anything be more important than learning how to help abused children of God? Does our emphasis on personal piety keep us focused on helping individuals rather than dismantling religious structures that prevent full gender equality and result in sins such as IPV? And, finally, if we cannot help women victims of violence in our own congregations, how can we possibly ever be salt and light in the world? This book is a tribute to the remarkable life of a remarkable woman. With God's grace and help, we will grasp hold of Dr. Kroeger's baton and continue the race to bring peace and safety to Christian homes.